Trophy-magnet Marc Levers would love a sleepless night of a different kind on Sunday. The Phantoms forward recently became a father for the first time when wife, Megan, gave birth to son Louie. He admits the new addition to the family has made for a tiring few days in the build-up to Coventry, but he’ll hope to be celebrating long into the night after another major triumph. The former Great Britiain international ace has captured a glut of honours during his lengthy career. He won six Challenge Cup crowns, three Elite League Play-Offs trophies and two Elite League titles during a hugely successful top-level career with Nottingham and Belfast before tasting success in the second tier for the first time as Phantoms ruled supreme last term. Now, a year on, he still has room for another addition to his collection. Levers said: “I must admit it’s pretty tiring getting used to having a baby at home. “My son was born just under a fortnight ago so it is a very happy time for us and winning the play-offs would only add to that. “Everyone plays this game to be successful and challenge for trophies – and I’m no different. I absolutely despise losing and I’m a very grumpy person whenever it happens. “Playing in the finals was a fresh challenge for a lot of the guys last year as they hadn’t been involved at that stage before. “But that is not the case this time. We still have the majority of those guys and we have that experience to draw on. Levers produced a crucial strike at a key stage of the final triumph against Manchester last season. His fourth goal in a 5-2 success came just as Phoenix were battling back into a clash that Phantoms had earlier led 3-0. But the 34 year-old admits Phantoms may face a tougher task this time around than when lifting the trophy 12 months ago. 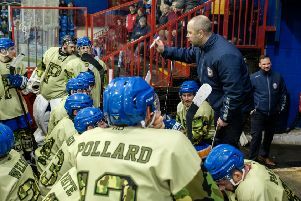 He feels the teams to have made it to the Skydome – league champions Basingstoke, Phantoms, their semi-final opponents Guildford, and Milton Keynes – are far more evenly-matched than the final four last term. But Levers is not in the slightest bit daunted about the prospect of facing the Flames on Saturday even though Phantoms were on the receiving end of an EPL Cup final drubbing at their hands. They went down 12-6 on aggregate in the knockout showpiece after a 9-1 collapse in the opening leg. “It will probably be harder for us this year as there is much more strength around the league. “The teams that have made it to Coventry are all capable of beating each other on any given day,” he said. “We can’t look beyond the first game. We need to focus on starting well in the first 20 minutes and go on from there.